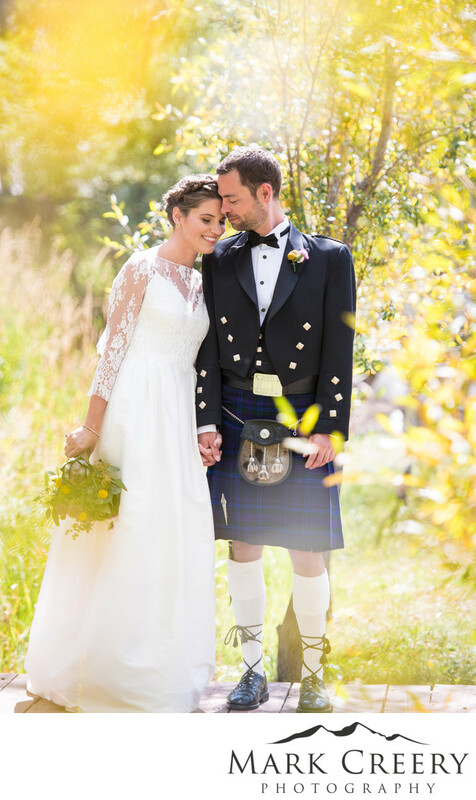 Mark Creery Photography is a leading Colorado wedding photographer in Steamboat Springs who can capture the amazing scenery the area offers while still showcasing your personalities. There are many great venues to choose from in Steamboat, and Perry Mansfield Performing Arts School is one of them. This is where Gretchen and Duncan's September wedding took place, as you can see in this photo. The colors on the leaves were just starting to change and we managed to find a small patch of yellow color near the ceremony site to capture this dreamy image. Duncan has Scottish heritage and so he and his groomsmen all wore traditional kilts for the occasion. Check out their wedding album design on my website.